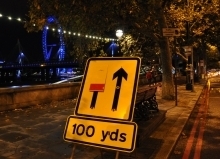 Assess the site with the aim of allowing surveyors access to each carriageway lane underneath the Hungerford Bridge. Only one lane was required at any one time, to allow the client to access the underneath of the structure via a mobile elevated working platform. The first stage of our process was to carry out a site survey. 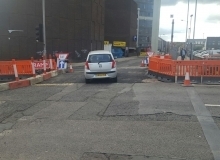 This survey takes into consideration all possible effects of installing temporary traffic management and especially at this location where the volume of vehicles is exceptionally high. Once the survey had been complete, the next phase was to draw up the plans. 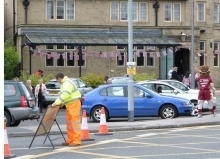 After submission for Transport for London approval, consultation took place and the plans and hours of work were approved. At this stage we were then able to contact London Buses to complete the suspension of bus stops. 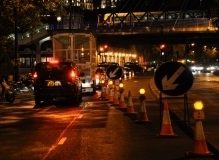 On the night traffic was particularly busy westbound, so the decision was made to install the traffic management in this direction in the quieter hours. Each phase was achieved over the hours allowed and the survey was completed on time. 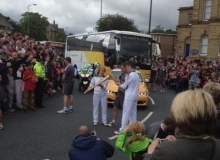 Create a safe passing of the Olympic torch through a number of towns/cities across Yorkshire. Using pre-agreed routes, design and plan road closures and diversions to enable a sterile area for the relay. 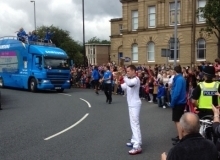 A route for the relay had already been decided by the local authorites prior to our involvement, so our initial survey had to take into consideration all possible effects on the traffic heading into each area and also traffic within the closure area. 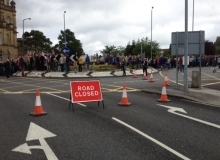 Plans were drawn up and the diversions and the locations of the blockades were agreed. 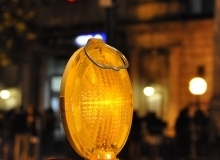 Letter drops to affected residents were undertaken and advanced warning signs were installed 14 days prior to pre-warn traffic of the possible delays. Each relay went ahead without issue and considering the nature of the events and with the potential for problems quite high, we were pleased to receive very positive feedback from our clients. Organising and managing high profile occasions such as these, enforces Centurion’s ability to work on such events. 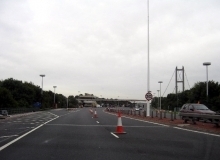 Work began in September 2013 to replace four solid steel A-frames which connect the main span bridge deck to the towers at either end of the bridge. Associated work was also carried out to strengthem the landmark crossing. 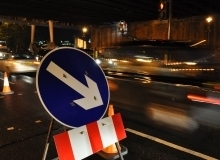 The works require the closure of the nearside lane in both directions with speed restrictions, to reduce load weights on the whole structure whilst this work is carried out and to enable access to the working areas. In addition TVCBs will be positioned adjacent to the work areas to protect the workforce whilst any deck works are carried out. Prior to commencement a full on-site survey was undertaken and approved in conjunction with our client. 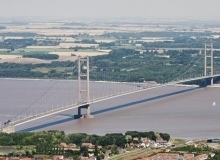 A selection of traffic management plans and method statements were formulated for submission to the Humber Bridge Board. Once the planning stage was complete and approved, mobilisation was prepared. This included liaising with selected sub-contractors and the overall preperation of equipment to be ready for the start date. 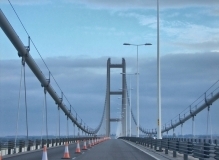 With the aid of our Impact Protection Vehicles we installed the lane one closures over the full length of the bridge, the speed restriction and the TVCBs. Once all in place it was then time to mobilise our maintenance crews. Works are ongoing and resource levels have remained the same even through some very challenging conditions, not least the severe storms which saw 85mph winds hitting the bridge. Works are due for completion in Summer 2014. 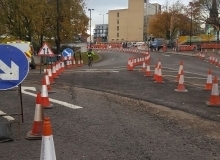 We have recently installed Phase 2 of the traffic management for our client. 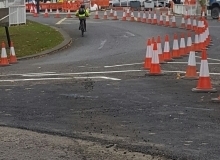 A new temporary road layout has been installed and the road marking altered to suit through one of our supply chain partners 'Jointline'. New pedestrian routes hve been installed and a temporary push button pedestrian crossing has been utilised whilst exisiting signals are being removed. 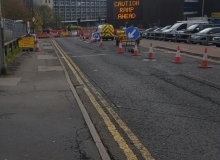 VMS signs have also been positioned in key locations to warn motorists of the new road layout and temporary obstructions.